For you, there's nothing better than being at one with nature. During a hike, it's about more than the destination; it's about the sights, the smells, the sounds, and your connection with the world around you. To help keep you comfortable and dry, wear this Wrangle ... (see full details) (see specifications) #MJK023X. For you, there's nothing better than being at one with nature. During a hike, it's about more than the destination; it's about the sights, the smells, the sounds, and your connection with the world around you. To help keep you comfortable and dry, wear this Wrangler Men's Black MJK023X Water-Repellent Trail Jacket. 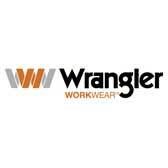 It's carefully designed by Wrangler to bring you lightweight comfort, warmth, and protection from external wetness. It's also made with numerous pockets so you have plenty of storage space for those necessary items. Crafted from a performance blend of 95% polyester and 5% spandex, this men's water-repellent jacket is made to bring you warmth and comfort. The polyester is lightweight and strong, while the spandex makes the fabric flexible, giving you a wide range of movement and enhanced mobility. When you're moving, the fleece lining will keep you warm without being heavy and bulky. For a customizable fit, this trail jacket is made with an adjustable waist and cuffs. In addition to helping keep you warm and comfortable, this men’s water-resistant jacket is designed to keep you dry even when the weather isn't. The polyester and spandex exterior is water-repellent, which means that as water hits the exterior, it will not be absorbed. Instead, it will simply roll away. It's an excellent choice for misty mornings and afternoon showers. To keep your hands free, this trail outwear has plenty of pockets. Outside, there are two lower pockets with zippers. Use them to keep your hands warm or zip them up for secure storage. An exterior chest pocket closes with a vertical zipper. And an inside pocket with media port also zips shut. Offered here in go-with-everything black, the sporty design features Wrangler embroidery on the left sleeve and a stand-up collar. The front zipper extends from the collar to the bottom of the jacket. When it comes to hiking, avoid the discomfort of wet and cold with this Wrangler Men's Black MJK023X Water-Repellent Trail Jacket. Order yours today from Working Person's Store, and then get out there and enjoy your hike. Wrangler Jackets: Men's Black MJK023X Water-Repellent Trail Jacket is being added to your cart.